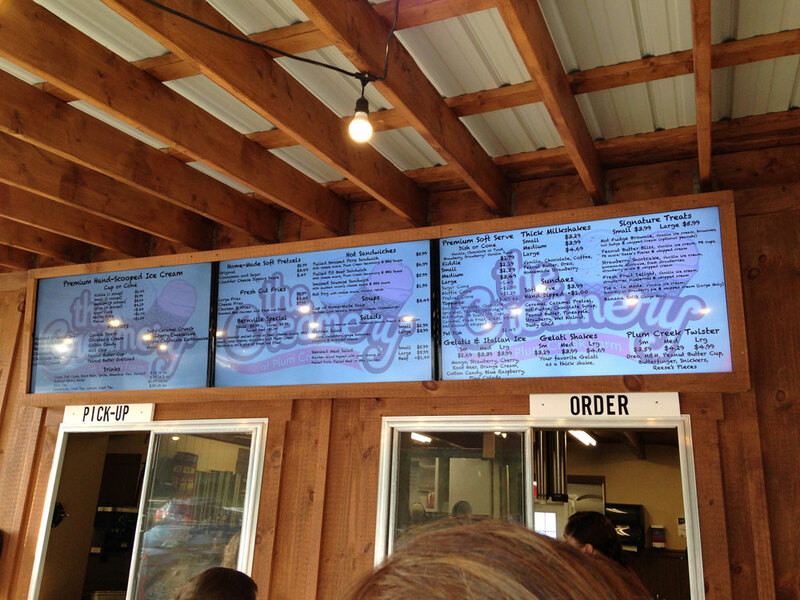 Last summer, my brother clued me in to a new ice cream place called Plum Creek Farm. The small place had recently opened, and they were serving homemade soft serve ice cream. We checked it out and quickly fell in love with both the ice cream and the small farm market store. Plum Creek operates seasonally so we got our last taste of it in the fall and awaited its reopening in April. This year brought an expanded menu of hot food items, new hard ice cream (not homemade but locally made) and more treats. The hot food menu was definitely something we wanted to try. Last year, it was an evolving menu but it finally seems to be set, with sandwiches that include pulled pork, smoked sausage, pit beef and hot dogs; fresh-cut fries; homemade soups; and soft pretzels. (There are also salads if you want to save Calories for dessert). 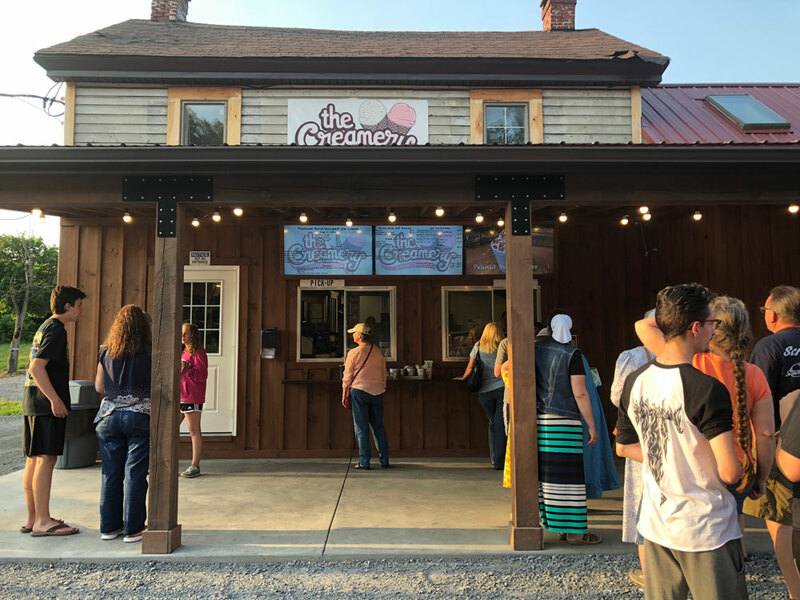 We stopped by on a weeknight in early June and the line to order showed that the word is definitely out about Plum Creek. It was a long wait for our dinners. That wasn’t the case for ice cream cones as an efficient ordering system had cones delivered before the customers even had paid. But for hot food, and for specialty desserts, it took time. I stood and watched as cone after cone was handed off. Then a cup of soup. Occasionally, a sandwich. Finally, after what seemed like hours (it was probably 20 minutes), my name was called and our sandwiches were ready. We dined at one of many picnic tables that make up the “dining area.” There are also Adirondack chairs, benches, all outside. Maybe I was just really hungry, but from the first bite, I really enjoyed my pulled pork sandwich. Now, I fully recognize that this pulled pork will never win a barbecue competition. But it was still very good. The sauce was sweeter than most, almost a little too sweet, but I think what really made the sandwich was Plum Creek’s seasoning. It was sprinkled on as the sandwich was constructed. The basic salt and pepper were there with additional spices. It wasn’t spicy, but it added little hits of flavor to every bite. 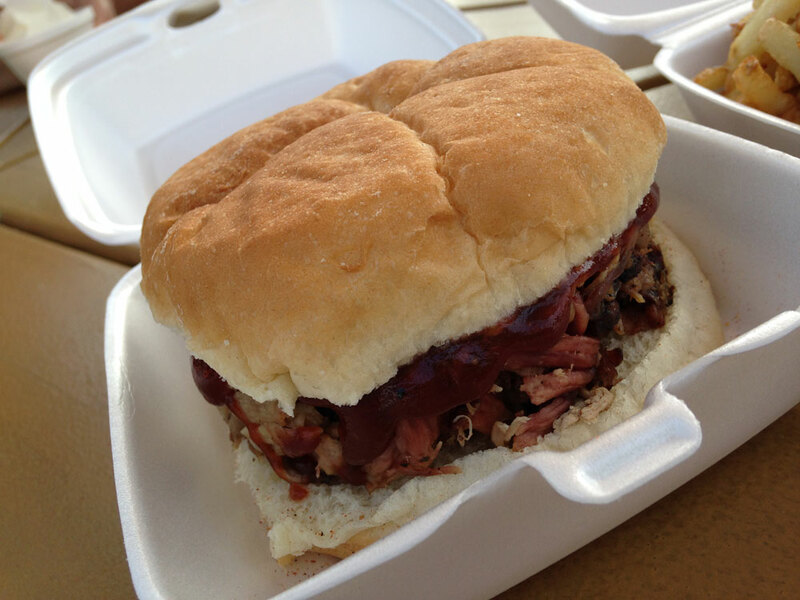 The seasoning was even better, in my opinion, on Julie’s pit beef sandwich. She thought it was a little salty, but I thought it worked. Her sandwich was served with cheese (that’s the standard at Plum Creek; I opted for mine without). 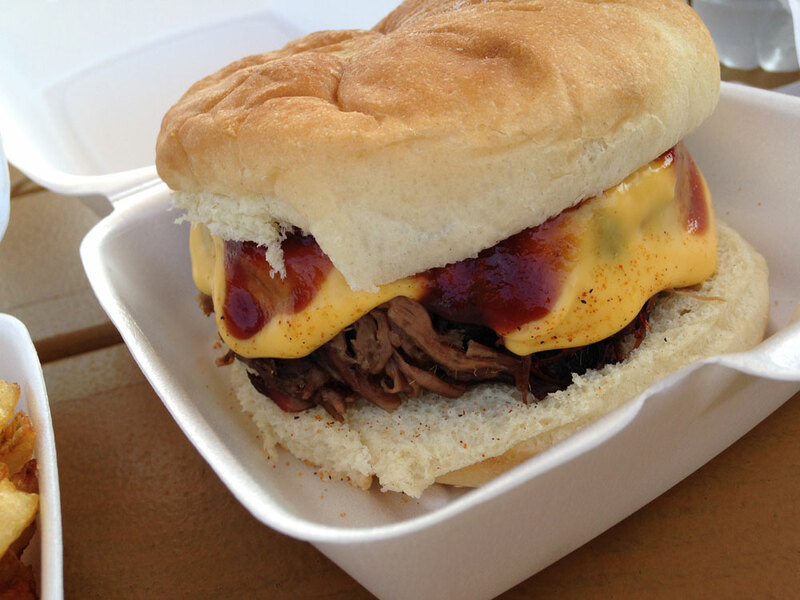 It’s not the norm for barbecue, but Julie enjoyed this change of pace. Both sandwiches were served on Kaiser rolls that served their purpose, holding in all of the meat and sauce without crumbling. We both really enjoyed the side of fries that we shared. They most closely resembled the shoestring fries that you’ll find locally at Austin’s and Coastal Grille. 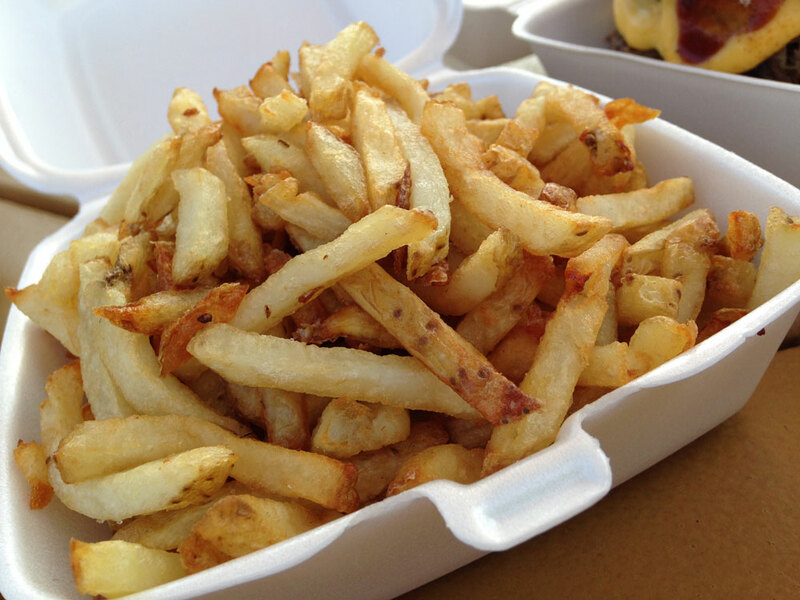 The fries were cut very thin and short, making it easy to pick up a handful at once. And they came out piping hot – I can only assume this was what delayed our order. Of course we couldn’t come to Plum Creek without getting ice cream. And even though we were comfortably full after dinner, we couldn’t resist trying some of their signature desserts. 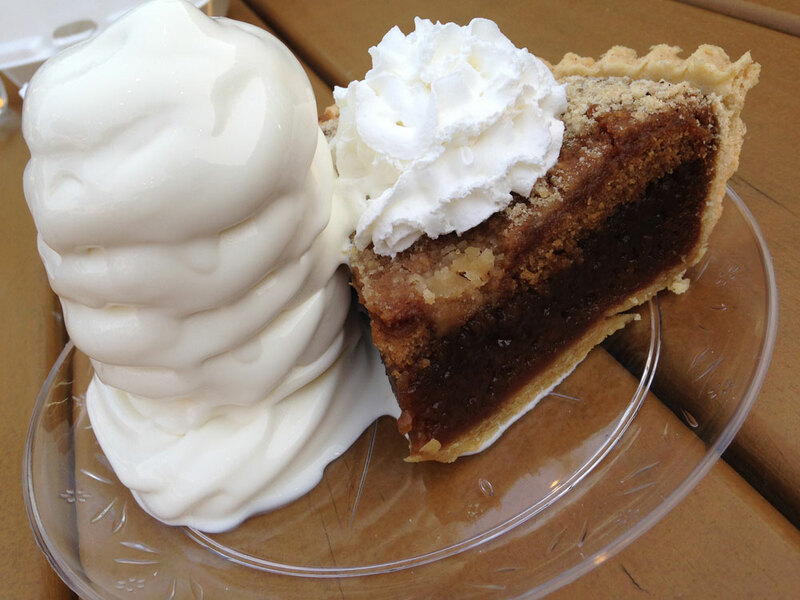 My sweet of choice was the pie a la mode. I chose the shoo-fly pie (strawberry is also available) and have to admit that I was a little disappointed in the pie. It drier than it looked with a rather plain crust. But the homemade vanilla soft serve was excellent. It’s a heavy ice cream that is better and more flavorful than your typical soft serve mix. I probably would have been happier – and certainly more comfortable – had I just settled for a cone of vanilla. Julie was not disappointed with her strawberry shortcake, though she would also admit that she didn’t need that much food. 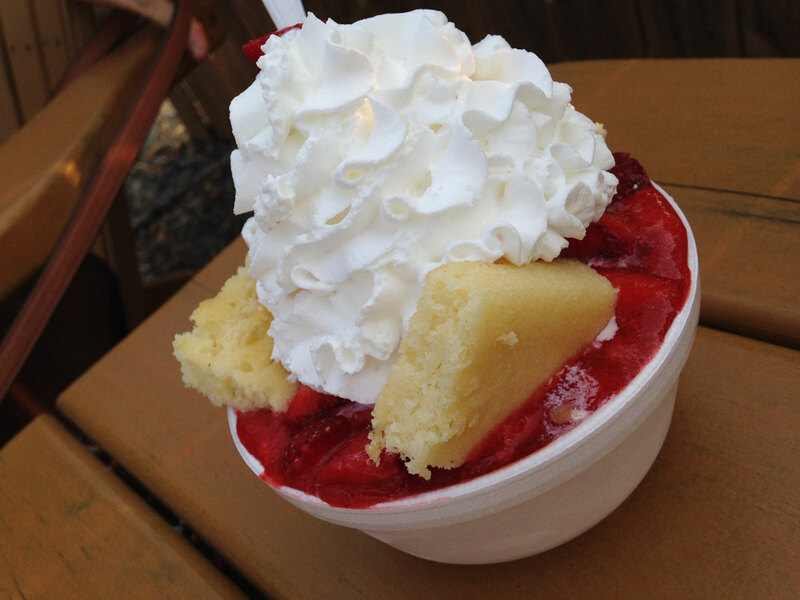 The shortcake was topped with strawberries (you can buy Plum Creek’s fresh-picked strawberries from their store), strawberry sauce, vanilla ice cream and whipped cream. Everything about this was excellent, but there’s just nothing better than fresh strawberries and a homemade strawberry sauce on a shortcake. One downside of the way we did things was that we had to go through the line a second time. 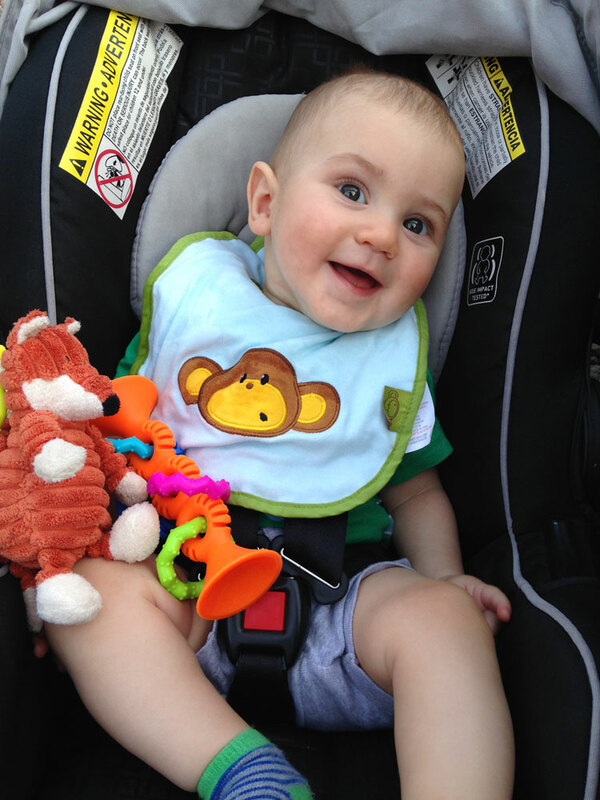 While Julie stood in line for dessert, I gave Jakob a bottle so it worked out. But we spent a long evening – and around $35 – at Plum Creek. Last year, I could have argued that Plum Creek Farm was a hidden gem. But with long lines on an ordinary weeknight, I’d say the word is already out. But those crowds won’t scare us away this summer, and they shouldn’t scare you away either.